New construction activities can be designed and managed to provide a high confidence of cross bore free results. The following is a discussion which is focused on preventing and verifying that new construction of utility distribution lines does not intersect sewer utilities. New tools, enhancement to existing technologies and better project management are key elements to provide the owner an installation that has minimized the risk of cross bores. The initial focus of CBSA is elimination of intersecting natural gas lines in sewers including legacy installations and new construction. Elimination of all intersecting underground utility lines of all types is the ultimate goal of CBSA. 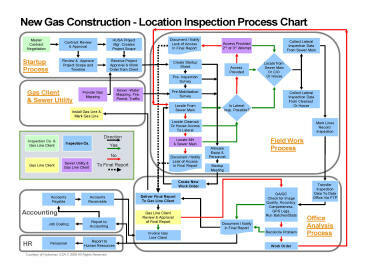 Locating of utilities, prior to construction, is normally required by state regulations. It is an important first step. Most states have specific requirements but they vary widely from state to state. Cross bore prevention can be assured with proper selection of methods and management of installations. Project management is the key element in successful prevention of new cross bores. Owners and contractors both must design the projects and processes cooperatively to have success. There is a high potential for creating cross bores unless proper procedures, locating of existing utilities and verification procedures are used. Development of consensus procedures and processes are a key element of the need for CBSA. Legacy cross bore procedures have been developed by CBSA. New construction procedures are currently being developed by CBSA. Results of numerous legacy verification projects indicate in the high risk areas that have suspected cross bores, the number of cross bores found per mile of mainline sewer inspected have been between 2 and 3. Current best practices can prevent cross bores of gas lines into sewers from resulting in property damage, injury or death. Click Above Image for Large PDF Version. Excavate an open trench manually, by backhoe or by trencher. These techniques allow inspection of the trench bottom and any intersected utilities. Repairs can be made if needed. Moles can be guided only by their initial positioning. If rocks, roots or other objects are hit as the percussive action of the mole moves it forward, unseen deviation from planned alignment can occur. Plows can install new utilities by pulling a vertical curved steel plate through the soil while a small diameter utility is feed into the ground simultaneously. There is no opportunity to observe bottom of the excavation. Elevation and horizontal positioning are good with plows. HDD (horizontal directional drills) are the newest tools in this category have the ability to be steered by using sondes and receivers respectively emitting and receiving radio frequencies. Accuracies vary, but generally have a comfort range of +- 2 ft for location. Long distance and great depths can be achieved. There is no opportunity to observe the condition of the bore directly. At best, some deduction may be noted by sound and feel by the HDD operator.